Building on the already impressive, award winning Ai V9 we have added even more new features to continue to deliver the ‘everything you always wanted’ in a media server ethos. Synergy has won the Plasa Innovation Award 2018 and is coming soon to Ai and Titan, find out more here. These are some more of the remarkable features that allow the award winning Ai media servers to enable such breath-taking visual environments. After Adobe dropped support for the encoding of content, we have extended our AiM codec to the latest Adobe suite of software. This is a pivotal step in ensuring that content creation teams can render videos out to AiM in the most effective, up to date way possible. Add tracks for each layer of each screen fixture and drag content to the track. Then attribute and control tracks can be added, which are easily but precisely edited all within the one interface. Once some layers are controlled via the timeline, it’s still possible to perform live with other layers simultaneously – great for live music, but also for corporate events where the goalposts can move at any time. We have worked hard to address user's concerns regarding the simplicity of operating Ai. In light of his we have started an extensive GUI overhaul, starting with the menu structuring of specific operations. This also includes a full icon overhaul, designed with a cohesive iconography in mind. It is our aim that no user struggles to understand the interface of the software and we will be continually developing the user experience to make sure that our user base finds the operation of Ai; quick, simple and ergonomic. Collectively known as 'mesh-warp'. This is functionality that has been requested by our user group to aid in setting up projection surfaces when technicians have little time on site. It applies a 'projective' keystone which stops straight lines from deforming into curves. The grid warp functionality allows you to subdivide your screen into smaller squares and then deform these to fit your screen. Analysing a video file and determining how many beats it contains, this functionality allows you to sync your videos to a beat. Whether this be user-entered per layer or generated from external software straight from the CDJ. This feature allows the user to keep a video tightly synchronised to the DJ. Spout is a revolutionising open-source standard that allows for applications to share texture data. This allows the users to create an application and run it on an Ai machine and then feed back this into Ai. The possibilities here really are limitless, depending on what the custom application does. 8 HDSDI Inputs via 2xDatapath SDi4 allows us to increase our professional video inputs to 8. The more inputs the less restrictive your camera setup can be, reducing the need for additional equipment to switch camera feeds and someone to make sure it works. It's a new comer in the professional market and provides a node based solution for generating effects in real time. Once you have the effect you are happy with, just export this as a Notch 'Block' and load it into Ai. Ai will then run the block and send the generation out to what layer you have selected. NDI then we can receive it. Ai V8 offers a revolutionary new camera automated warp and blend feature. 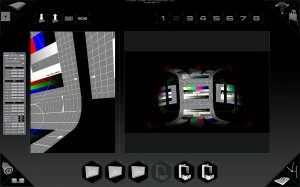 This allows the user to configure a large projection screen surface across all available video outputs on the system using our recommended webcam or Ethernet camera and custom software to automatically calculate the required warping and blending of the outputs on many surface types including; curved, domes and flat arrays. Multiple servers are also supported in the automated warp and blend process using an IP camera, which allows blends across huge surfaces. See Autoblend in action with PHISH or watch a VIDEO on the feature. The new Output Configuration page allows the user to configure all parameters of their outputs using a unique UI for each Fixture Group tailored to the requirements of the Fixture. All of your video outputs and Artnet output can be configured on this page. It includes simple yet powerful tools for LED screen configuration, a navigable mapping editor for projection mapping and an all new Artnet Pixel mapping system. You can also apply soft edge blends and use Ai’s Auto Map feature from this page. 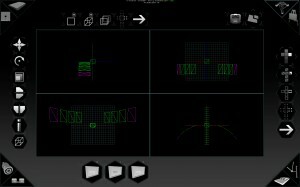 This new page gives the non 3D application user the capability to create and edit 3D stage sets. It combines the best bits of Max, Maya, Blender etc. But with easy access to features designed specifically for our market like linear and radial repeat for object geometry. The user can flip between the new Surface Modelling Mode and Stage View Mode to instantly see how the screen you’re designing fits with the rest of the stage. Novice to intermediate users can now configure their shows without using the node based environment. Acknowledging that there is unrivalled power and flexibility in the node based capabilities of Ai, the node based interface has been refined to allow users to feel more comfortable using it. The Node based interface is now shown within the Ai User Interface window rather than in many sub windows. It is displayed in a pseudo 3D style which animates to zoom in when you enter a sub patch. We have also added the capability to zoom into modules giving you the option to work as small or large as you require. 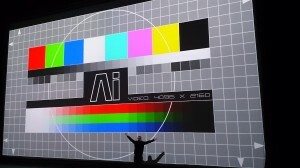 The Ai developers have made a massive improvement in the performance of Ai V8, optimising the render engine again to offer around a 50% improvement in video throughput using our AiM Superstream codec. Performance whilst live compositing high resolution background layers with low resolution foreground layers has also been much improved. Support has been added for up to 8 x 1080p 3G-SDI inputs or up to 8 x 1080p outputs or 2 x 4k outputs as an option on the Ai R and RX series systems. The outputs are frame synchronised so four 1080p outputs can be used as a single 4k feed on four HD/SDI cables. Ai V7 introduced Scene Triggers which allowed you to store a pre-set state of all layers and attributes that could be recalled at the touch of a button. 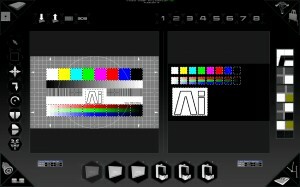 Ai V8 makes the scene triggers editable so that you can configure or remove triggering elements. This allows the user to decide exactly which aspects of the system the scene trigger will control. 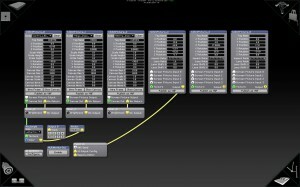 V8 has a brand new Effects system (SVFX) which allows users to use the node based programming system to create their own effects and add them into the system. These effects can utilise the Salvation set of tools and input/output modules along with GLSL, Java script, MIDI, the list goes on and on. In fact, pretty much any of the other features of Ai can be plugged into your own customizable effects. This new effects system has proven to be so efficient that we have re-written our entire effects library for V8 using this approach. We have also added some new effects to spice up your video shows. Using the same new Effects system (SVFX) support has been added for user customizable blend modes. We have re-written the current set of blend modes to use this approach and there will be a template available for any user who wishes to use this system to make their own blend modes. A new module that can reference a texture from a fixture and layer. This offers significant performance improvements when a user needs to play the same media out onto multiple screen surfaces or onto multiple layers. The AiM Quicktime encoder now supports multi-core compression. 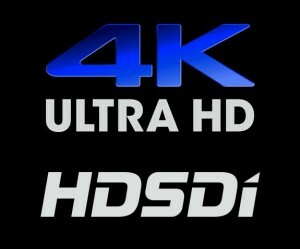 This means that the AiM conversion process can now be done in faster than real time for HD footage and close to real time for 4k media on high spec systems. V8 improves on its hands on function by adding the capability to scrub media on a layer by clicking and dragging the progress bar.